Fast food tastes so good to many people, in part because restaurants add a liberal amount of salt to their food. This also means the items are too high in sodium to be healthy. Since too much sodium increases your risk of heart attack and stroke, limit your consumption to 1,500 milligrams or less per day, the American Heart Association recommends. Fortunately, you have options that let you eat a fast-food meal without consuming an unhealthy amount of sodium. One easy way to cut the sodium content of your fast-food meal is to skip the fries, hush puppies and onion rings. A large order of fast-food fries, for example, contains 355 milligrams of sodium, about one-quarter of your daily 1,500-milligram limit. Swap the fries for a tossed green salad with the dressing on the side or a plain baked potato to cut your sodium intake. Many fast-food restaurants also offer fruit, such as apple slices or mandarin oranges, in place of fries, and these are also much lower in sodium. The average fast-food cheeseburger contains 1,314 milligrams of sodium, dangerously close to your daily limit. A typical sub sandwich contains even more sodium, 1,651 milligrams, which exceeds what you should have for the entire day. Ann Louise Gittleman, author of "Get the Salt Out: 501 Simple Ways to Cut the Salt Out of Any Diet," recommends skipping burgers and sandwiches altogether. At the very least, skip the cheese, pickles, ketchup, mustard and mayonnaise on your burger to cut the sodium content. Opt for grilled chicken sandwiches in place of cold cuts as another lower-sodium option. A piece of grilled chicken at your local fried chicken fast-food restaurant is lower in sodium than fried chicken. A fried chicken sandwich, for example, contains 957 milligrams of sodium, while grilled chicken doesn't contain much, as long as the restaurant doesn't sprinkle it with salt during cooking. Skip the meat-based Mexican food, too. A fast-food beef taco contains 1,044 milligrams of sodium, and a fast-food beef tostada contains 871 milligrams. Order your Mexican food with whole beans instead of refried beans or meat and pass on the cheese to cut the sodium content. Grilled fish sandwiches or tacos are another lower-sodium option. Skip a pizza fast-food meal, because pizza tends to be high in sodium. A slice of fast-food pepperoni pizza, for example, contains 726 milligrams of sodium. If you must have pizza, order a slice without meat and ask the cook to go easy on the cheese as two ways to cut your sodium intake. 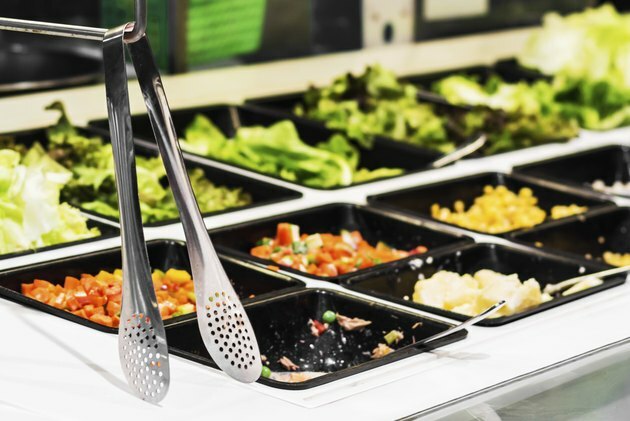 Look for a fast-food restaurant with a salad bar, Gittleman recommends. This way, you can build a healthy meal based on nutritious, fresh vegetables, fruit and grains. Skip creamy salads and toppings, such as bacon bits, however, to keep the salad lower in sodium.